The Western Snowy Plover, Charadrius nivosus nivosus, is a shorebird that inhabits beaches and lake shores. The Pacific Coast population of the Western Snowy Plover was listed as "threatened" under the Endangered Species Act in 1993 because of declining populations mainly due to loss of habitat. The stretch of beach between Isla Vista and Ellwood (including Sands Beach) was designated "Critical Habitat" in December of 1999; at the time of the critical habitat designation, the population in the entire Pacific Coast of the United States was estimated at less than 1500 individuals. Coal Oil Point Reserve, with its sandy beach, sand dunes, and adjacent estuary mouth is one of a few choice west coast locations where the snowy plovers can still breed and thrive. With public education and symbolic fences, the plovers at COPR made a comeback. We became the first site that had lost its breeding population entirely for several decades and then recovered its population after conservation measures were implemented. 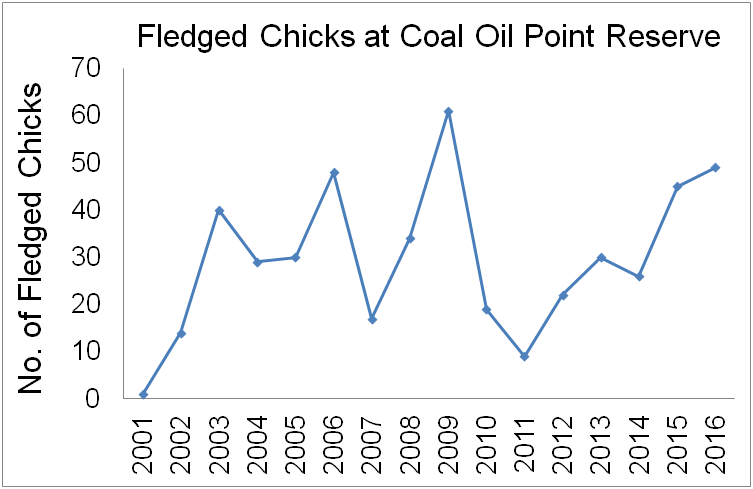 COPR now averages 30 fledged chicks per year (Figure 1). These efforts show that people can reverse the unfortunate trend to extinction by sharing space with other species. Figure 1. Number of plover chicks that have fledged since Coal Oil Point Reserve became a restored nesting site in 2001. Up to 400 Western Snowy Plovers (includes Pacific and Inland populations) feed and rest on Sands Beach each winter. This is the largest winter aggregation in the US. Sands Beach, at Coal Oil Point Reserve, is a very special place for snowy plovers because it provides high quality habitat for these birds. Kelp from the rich forests in the ocean continuously wash ashore, creating wrack, which becomes food and shelter for many small invertebrates. Plovers and other shorebirds depend on the invertebrates for food. Beach hoppers, kelp flies, and other insects depend on the availability of kelp wrack on the beach. To understand how plovers are doing at Coal Oil Point Reserve, biologists count them weekly during the wintering season and daily during the breeding season. Each nest is mapped into a GIS database and each chick is observed three times a week until they are capable of flying (fledged). It takes one month for an egg to incubate and another month for a chick to grow large enough to fly. By observing the chicks and nests, the biologists can determine the cause of mortality by looking for predator tracks on the sand. Each predator (skunk, raccoon, crow, etc) leaves a distinct footprint on the sand. Sands Beach is open to the public all year, but portions of the dry sandy beach are closed. This is to reduce disturbance from foot traffic near the wintering plovers and the main nesting area. Between March 15th and September 15th, the protected area is extended to the western boundary of the Reserve, to protect nests that are built along the beach. The nests are well camouflaged and, without the fence, could be trampled by beach users unknowingly. The fence is symbolic, because it depends on vountary compliance for no-tresspassing. It does not keep dogs from walking under it. Thus, we ask everyone to leash their dogs at all times. Even the calmest dogs can become excited when they see the plovers or other wildlife. In 2003, an unleashed dog bit and killed a plover chick at Sands Beach. Research by USGS biologist, Dr. Kevin Lafferty, showed that a dog can cause 10 times more disturbance to a plover than a person walking by. This is because some dogs actively chased the plovers and because plovers respond by flying away from dogs more often than they would fly from people. Flying is one of the most demanding activities for birds and requires much energy. The plovers experience many pressures throughout the year. They have to deal with people and their pets, predators, and extreme weather conditions. The plovers and other declining species need your help. Please support this and other programs that are attempting to bring this bird back to the beaches. 1. Choose a beach which is not used by snowy plovers to exercise your dog. Or if you bring it to Sands Beach, PLEASE keep it on a leash (as is required by local, posted regulations) and keep it away from the fenced areas at all times. 2. When walking up and down the beach, stay on the wet, hard-packed sand; the plovers use this area less than the upper beach. 3. Don’t leave remains of food or trash. Left-over food attracts crows and other small mammals that prey on plover eggs. 4. If plovers react to you, retreat several paces and walk in a wide arc around them. 5. Become a volunteer docent and help teach the community about the plovers and sandy beach ecosystem. Your cooperation will help us reach a balance between conservation and recreation.